Is Cumbria's Moresby Hall haunted? 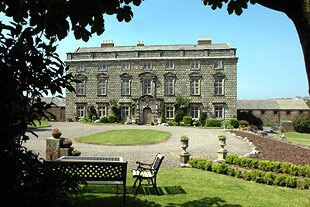 Moresby Hall is a hotel and manor house, situated in the small coastal village of Parton in Cumbria. The name of the manor house is thought to have originated from the name of the builder (Morisceby, Mawriceby or Moricebi - we're not sure!) and the building was originally built over 800 years ago in the early 12th century. The Fletcher family were the most notable owners, and also the longest resident family - owning the manor house for over 250 years! Several families then took ownership of the house after Thomas Fletcher died childless in the eighteenth century. The building became a farmhouse for some years, before being restored to its former glory in 1910 and finally, opened as a hotel in 1999. Built on the site of a Roman graveyard, bodies have been found in the building itself - under the floorboards and the chimney - and in the surrounding area. Near the fireplace, the figure of a cavalier has been reported over the years many times. Also, a pagan Celtic temple is said to have been situated nearby and a tunnel which runs under the house is said to be the source of many strange sights and sounds - perhaps this could be the spirit of Anne De Moresby, who still roams the building to this day?